Introducing the world’s tallest inflatable slide! SkySlide is sure to take the industry by storm with a combination of the most innovative technology, highest safety standards and breakthrough design for a ride never before experienced in an inflatable unit. Dimensions: 117’ x 46’ x 51’, Platform 40’. 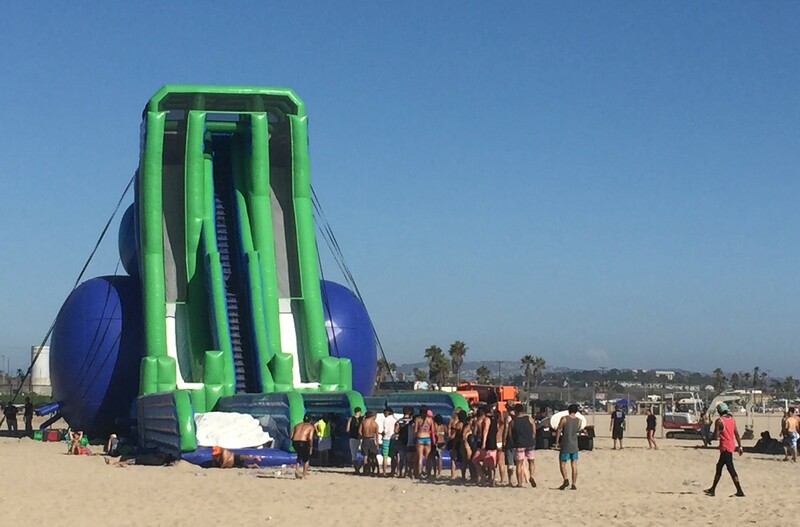 Introducing the world’s tallest inflatable slide! SkySlide is sure to take the industry by storm with a combination of the most innovative technology, highest safety standards and breakthrough design for a ride never before experienced in an inflatable unit. Measuring just over five stories tall, SkySlide® is the biggest inflatable waters slide in the world, combining two heart-pounding rides in one unit to appease everyone’s inner adrenaline junkie. With a 30-foot vertical drop on one side and the insanely fast VertiGo Super Slide on the other, both finishing off with a “kicker” that launches the rider into the air before softly landing onto the Inflatable Impact Attenuation System “IIAS”, this beast will not disappoint even the biggest thrill-seeker. Safety is a priority and the proof is in the design. After years of perfecting, Inflatable 2000® is now incorporating Inflatable Impact Attenuation System “IIAS” into its units. Originally created for Hollywood stunts and trapeze artists, this revolutionary system delivers less impact at greater heights and speeds allowing designers to go beyond backyard bouncy castles and enter into a world of true exhilaration. Removable SureTread stairs are made of impervious ABS plastic to withstand thousands of trampling feet before showing wear. Gone are the days of slippery foam stairs that degrade quickly. Although the magnitude of this enormous inflatables water slide may seem intimidating, the addition of several new technologies ensures effortless set-up and tear-down. The Cylindrovator base design inflates and deflates the unit in less than thirty minutes with the use of constant air blowers, to keep the party going, the EZ Drain system® redirects pooled water for fast, easy draining.